In a few minutes, we'll hear from personal mentor and everyday hero Craig Silverman. 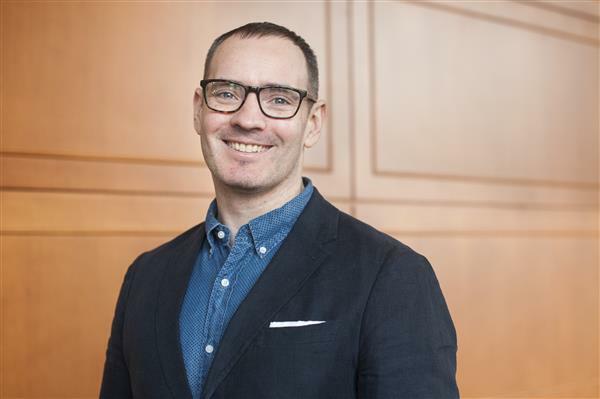 Craig is the founder of Emergent.info, a real-time rumor tracker, and a leading expert on media errors, accuracy and verification. He is a fellow with the Tow Center for Digital Journalism at Columbia University and the author of the new Tow report, “Lies, Damn Lies and Viral Content: How News Websites Spread (and Debunk) Online Rumors, Unverified Claims and Misinformation.” Craig is also the founder and editor of Regret the Error, a blog about media accuracy and the discipline of verification. ... and since he submitted this bio, he announced a new role as top dog at BuzzFeed Canada. Silverman's new shop is up and running in Ottawa. 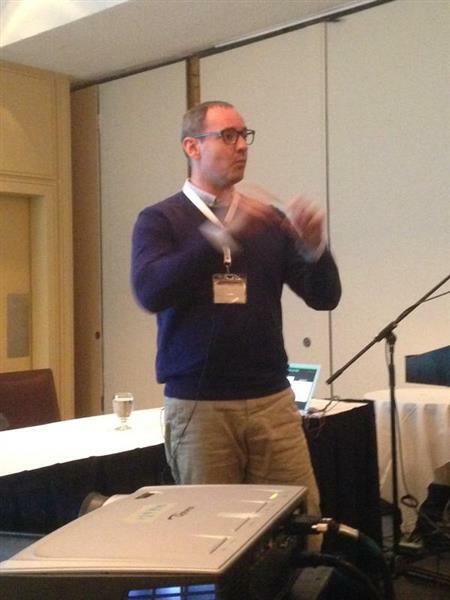 Here's today's story from Paul McLeod, who's actually in Halifax for #CAJ15. ... but that's not what this is all about. Craig's here to talk about how to spot a fake. Craig Silverman says you should always ask "How do you know that?". Great way to confirm sources and track things back. More complicated ways to confirm social media sources: Evaluate their tweets before/after, look at their friends, followers and retweets. If you're looking at a tweet, see what other information you can find about the person online- use apps such as Spokeo, Pipl and WebMii for searching for a user's social media presence. 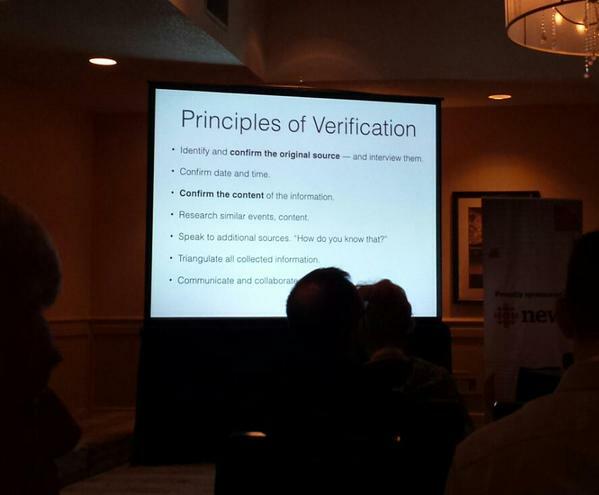 Important tool of verification: once you find the person you're trying to verify, gotta call 'em. It's useful to confirm their identity and also, of course, for stories. "They may have tweeted a photo, but have 10 others on their phone they didn't use." "When there is flooding during a hurricane, the street shark makes an appearance"... Content on social media tends to be circulated and recycled, both real and fake stories. Silverman is referencing the infamous "street shark," which reliably appears when any weather madness strikes somewhere in the world. The shark isn't the only fake-meme. There are others. The telephone is the best verification tool, period. But the Google reverse image search—and a Canadian product, TinEye—is the best online. Click on "search by image" at Google Images—and just watch the magic unfold before your eyes. Karma Decay (Reddit image search) is also a good reverse image search. It identifies any pictures discussed at Reddit, and Reddit covers most trends. Craig's talking about a lot of fun tricks: checking where shadows are in photos, and looking for inconsistencies. Hope he mentions bokeh! Lots of "pretty fakes" include conflicting bokeh (different shapes, inconsistent location, not associated with consistent lighting, etc.). Silverman is now leading the audience on a case study examining an image related to Boko Haram. After checking the source and conducting a reverse image search, his next step is to zoom in on the image, to see if you can spot any geographic markers or inconsistencies. 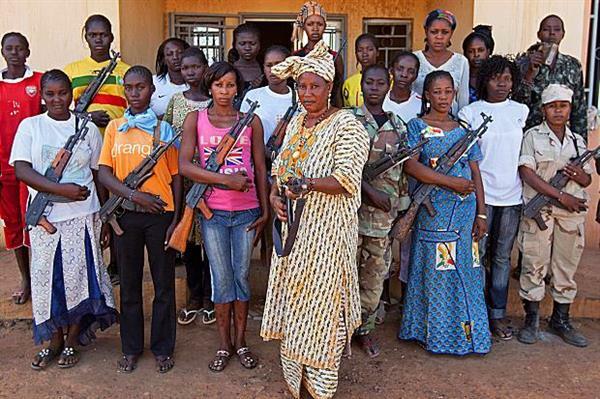 Case study time: Craig takes the audience through the verification process for a viral image of, allegedly, women taking up arms against Boko Haram. Reverse image search? Inconclusive. File metadata? Inconclusive. Time to look at the details. The solution? Find details that offer clues. In this case, a flag that doesn't resemble Nigeria's, where the photo was alleged to have been taken. The flag looked like Mali. Reverse image search with a Mali keyword? Bingo. 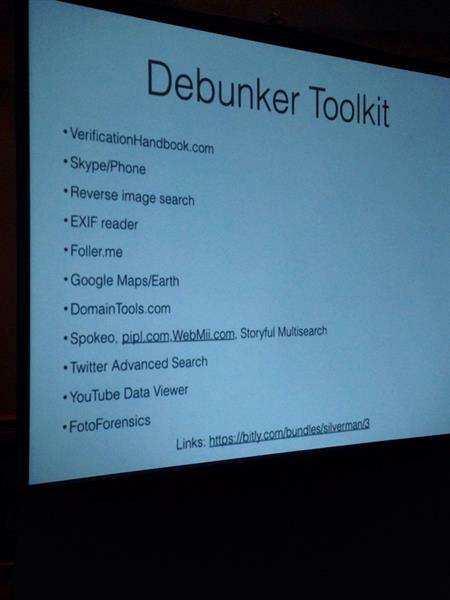 Craig Silverman's "Debunker Toolkit" is filled with useful tools to help you spot a fake! "Hurricane Sandy was a watershed event for online fakes"- Silverman says many news organizations got burned by fakes and started becoming more careful about verifying images. 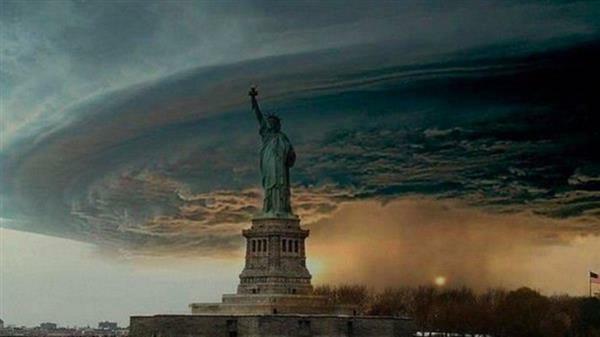 One of the guys who shared that Statue of Liberty photo found out it was fake and let his Facebook friends know about it... after it had been shared more than 100,000 times. It was shared a total of 300,000 times. "Not easy to put the genie back in the bottle," says Craig. Silverman says it is a combination of the tools that he shared, as well as good journalistic ethics and a healthy dose of skepticism that will allow you to spot fakes.